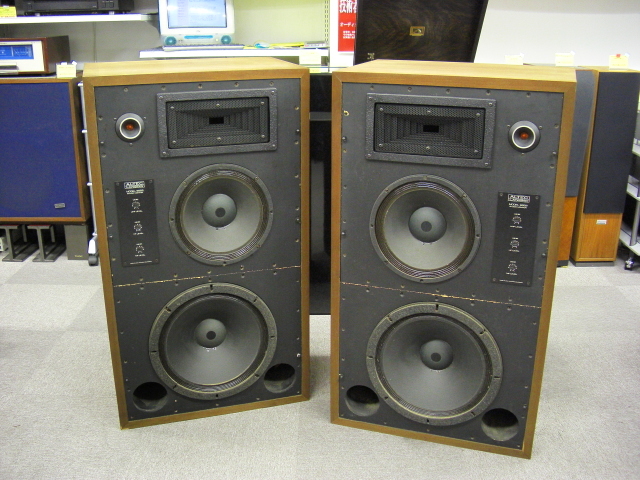 The Altec Lansing 9862 studio monitor speaker system was produced in the early eighties for sale exclusively to the Japanese market. It was a four way system using the 950-8A ring radiator tweeter, a 902 type driver on a special horn for the upper midrange, a 414 twelve inch driver for the lower midrange, and a subwoofer using a specially designed 416. The number of units built was very limited. The 416 woofer used all standard parts except for the cone, which was about 25 grams heavier than the stock cone. This allowed the driver to have the same low frequency performance as a standard 416, but in a much smaller enclosure with a sacrifice of about 3 dB in efficiency. A standard 416-8B/C in a nine cubic foot vented enclosure tuned around 40 Hertz has an F3 of about 40 Hertz with minimal ripple. A 416 built with the “heavy” 35239 cone has the same 40 Hertz F3 in a five cubic foot vented enclosure tuned to 30 Hertz. For those wanting to retain the excellent mid and upper range behavior of the standard 416, but with 40 Hertz performance in a much smaller enclosure, a 416 built with the 35239 cone is the answer.